The future belongs to secondary raw materials – or rather: They are the future. In Germany, waste sorting and recycling has been an established process for several years now. The systems are becoming increasingly efficient both in ecological and in financial terms. The latest treatment processes are high-tech and consequently, the recovered secondary raw materials are also of an increasingly better quality. "Down-cycling" is long since a thing of the past. In the contrary: Thanks to sophisticated recycling techniques, Germany is now on course to becoming a raw material supplier country – even though it does not actually have any natural raw material deposits whatsoever. This development represents a huge opportunity for the German industry to gain a high international profile with its respective expertise; it also reduces Germany’s dependence on raw materials, on extremely volatile prices and on politically unstable exporting countries. ASCON GmbH therefore trades in valuable raw materials; we buy them, collect them via our own systems, refine them, recycle them and market secondary raw materials all over the world. We will be expanding this operational business in future. 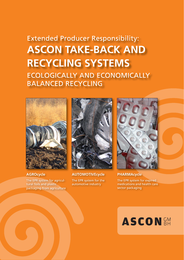 With its own raw material centres all over Germany, ASCON closes the recycling loop. A wide variety of material types from the holding company's collection systems are consolidated in these centres, refined through sorting, pressed into new bales of material, if necessary, and passed on to expert recycling companies that use them to manufacture new products. We also use the centres for the transfer and improvement of secondary raw materials, always with the aim of making the recycling process as environmentally friendly as possible.